REDMOND -- The final point for the St. Paul volleyball team's momentous 2018 season played out in the same rhythmic fashion the Buckaroos had executed so many times this fall. Senior libero Emma Connor received the ball, bumping it to the front of the net where junior setter Karlee Southland lofted it into perfect position for junior outside hitter Isabelle Wyss to emphatically slam it home. The Bucks ended their storybook perfect season on Saturday, defeating the Powder Valley Badgers in four sets (25-16, 12-25, 25-6, 25-12) in the Class 1A state championship game at Ridgeview High School to win the first state title in program history. "Our team has been working on this for so long and I'm just so proud of how everybody played," senior Megan Tuck said. "It's the best feeling in the world. It's amazing." It was a game pitting two veritable titans in the 1A volleyball scene on the biggest stage with everything on the line. St. Paul entered the game at 29-0, having lost three sets all season, while Powder Valley was an equally formidable 33-0. The Bucks came out of the gate with everything they had in the first set, winning 25-16. The Badgers answered back in the second, winning 25-12. It was the biggest deficit St. Paul had seen in a set loss all season, but rather than panic, the team galvanized in the third set. With the score tied at 3-3, St. Paul scored 16 consecutive points with Tuck serving en route to handing Powder Valley an emphatic 25-6 loss. 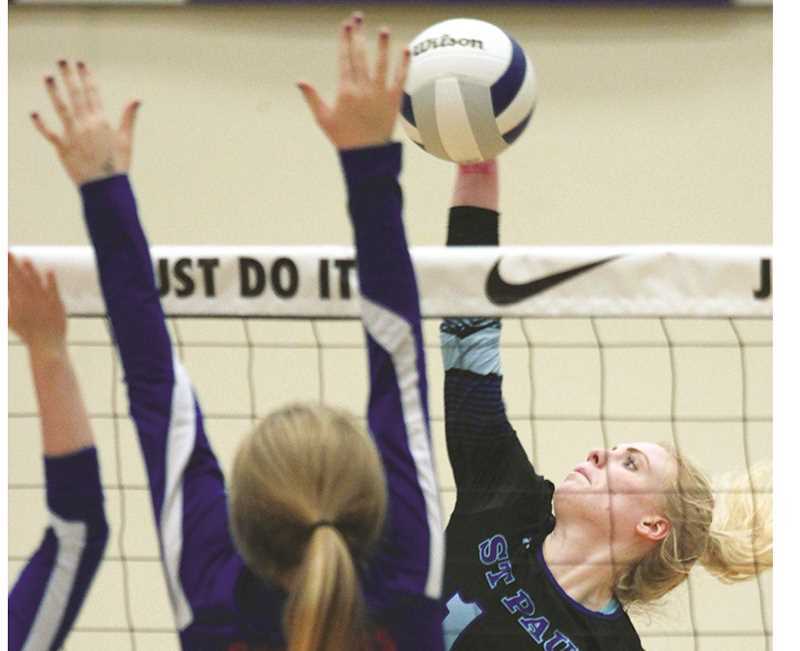 "Even in games where we would get behind or down, they were calm and confident and they would come back and we showed that in this championship match," SPHS coach Les Hiller said. "That team really beat us in that second game and we were like, 'OK, let's show them what we can do.'" From there, the Bucks could smell blood in the water and continued to methodically build point after point against the Badgers, who seemingly had no answer for St. Paul's run. Fittingly, it was Tuck who once again was serving during the final points, recording an ace to give the Bucks a 23-12 lead, followed by a block from junior Erin Counts to make it game point. "I think that's what got us through so far after losing that one set," Tuck said. "We just had to clear our minds and take it one point at a time and slowly work our way to that finish line." It was the same indomitable spirit the Bucks showed in their path to the championship game. After opening the quarterfinals with a 3-0 win (25-10, 25-13, 25-22) over league rival Perrydale, the Bucks faced a difficult opponent in the semifinals — the North Douglas Warriors. St. Paul won the first set against the Warriors, but found themselves down 24-19 in the second set and in danger of losing momentum. The Bucks proceeded to rattle off six consecutive points to take a 25-24 lead and went on to win the set 27-25. They finished the game with a 25-20 victory in the third set to complete the sweep and earn a berth in the championship game for only the third time in school history. However, this year's St. Paul team completed the journey the 1987 and 1993 state finalist teams began, a goal that the athletes had from the moment the season began. "We had it in the back of our minds and we had been thinking about it all season," Tuck said. "This was always our end goal and we did it. It's an amazing feeling." Tuck was one of six seniors who will finish their high school volleyball careers on top, joining teammates Connor, Hailey Farrell, Mercedes Smith, Korina Rosas and Amanda Mingo. The Bucks have grown up playing volleyball together long before entering high school and continued to show an eagerness to learn and get better throughout the season, up until the last weekend of the year. "The biggest thing with these girls is they respect, they listen, they execute," Hiller said. "They never sat back and got comfortable with where they were at. Each individual kept working on getting better at what they did." After the game, Connor was named to the all-tournament second team, while Counts and Wyss garnered first team honors, setting the stage as the building blocks for next season's title defense along with teammates Destiny Smith, Jordan Caldwell and Karlee Southerland. "We have five returning, and that junior class is so strong, but we have six we're losing, so it's going to be a building year," Hiller said. For now, the Bucks are content to revel in their victory and take pride in putting together the best volleyball season ever seen in St. Paul. "We've just gotten so close so many times, and for this year to be our year, it was amazing," Tuck said. "Just being with these girls, I couldn't have asked for a better team. It was amazing, it was a great season."